This was my favorite Leopard sighting since I started working at Thanda 18 month ago! 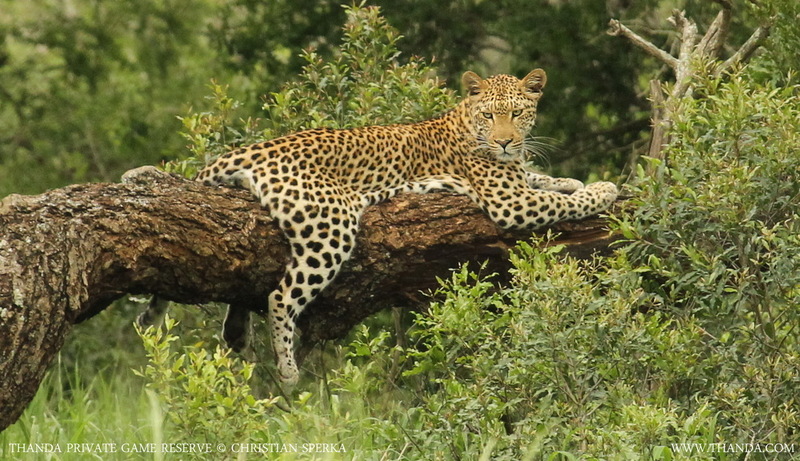 In the early morning hours we spotted this beautiful male Leopard lounging in a tree. He was quite relaxed, mustered us for a while, had a short nap, yawned a few times and then slowly disappeared into the bush. The reason why all the Thanda guests on my vehicle, Bheki – my tracker – and I liked this sighting so much was because this magnificent cat was not bothered by our presence and did not react to us and our vehicle, even if he was clearly aware of us. Observing animals without interfering with their behavior – my favorite kind of sighting!